There are several alternatives for the treatment of keratoconus available for people who suffer from this eye disease. Eyeglasses or soft contact lenses may be used to correct the mild nearsightedness and astigmatism caused by keratoconus in its mildest stage. Rigid Gas Permeable contact lenses (RGP or GP) will correct vision better than eyeglasses or soft contact lenses as keratoconus progresses. The rigidity of the lens enables it to arch over the cornea to create a smooth, uniform refracting surface to improve vision. 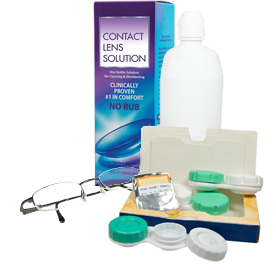 For some, these rigid contact lenses are the only way to correct vision adequately. These must be fitted with great care. Read more about contact lenses for keratoconus. Intacs plastic rings change the shape and location of the cone when they're inserted into the mid layer of the cornea. Corneal Collagen Cross-Linking (CXL) is a newer treatment option which has been shown to be effective at halting the progression of keratoconus. Corneal Collagen Cross-Linking + Laser: CXL can also be combined with an excimer laser treatment to help improve vision. Corneal Collagen Cross-Linking + T-PRK: CXL combined with an advanced laser treatment capable of correcting a wider range of eye vision irregularities. Corneal Transplant Surgery is necessary in very advanced cases of keratoconus. It is generally required due to scarring, extreme thinning or contact lens intolerance.